After I wrote this year’s Halloween mantras — “The Post About the Treats” — I got a pretty nice response from several people who said that the philosophy J. and I adhere to these days, as far as all that sugar goes, either a) makes sense to them; or b) is close to what they already do in their own homes. I have to admit that in a world of switch witches and Great Pumpkins and dentists buying candy back from young patients, it’s a little bit of an odd relief to me to hear that you all weren’t planning to disown me for letting L. and P. chow down on some good old-fashioned Halloween candy. Not that I’d change my tune if I thought you would — but thanks for sticking around. As I said in that post, it’s not really about strictly Halloween treats for us. It’s about ALL the treats. There are a lot of sweets and a lot of junk food land mines out there every single day, which is something none of you need me to tell you; lots of bloggers and journalists and medical experts have spoken about it far eloquently than li’l ole me possibly could. But as parents, we do need to make, oh, approximately four THOUSAND little choices every single week about what in the world we’re going to do in the face of all that temptation. Heck, even Eve couldn’t resist the apple….and if only we were talking about APPLES! It’s unfair, I think, to expect that children — and I’m talking particularly about LITTLE children here, since expectations obviously need to naturally scale up along with the age and development of our kids — will be able to manage their own junk food lust appropriately on their own. It’s all well and good for us to point fingers at one another when we debate about the propriety of junk food in schools and classrooms and say that it’s the responsibility of each family to tell their kids what they expect them to do when offered the manhole-cover-sized cupcake or the dixie cup full of Munchkins without Mom and Dad around. Ideally, I wish it could work that way. But honestly, would YOU turn that down every single time? I know some of you are saying, “Yes, I would.” And to you, I say: You are a better person than I. And a better person than most of the adults I know. My office has a nice little tradition of celebrating birthdays with a once-monthly “Cake Day.” Several different cakes from different bakeries are brought in, everyone sings “Happy Birthday” to the appropriate people, and we all eat a slice of something good. I usually choose the cake from the all-natural vegan bakery, on the premise that it’s at least less processed than the other options, but I still eat a damned slice of cake each and every month. Sometimes I ponder saying “no, thanks.” But I don’t know that I ever have. Cake is good, people. Pure and simple. Cake is good. And if I can’t say no to some good old cake, then what right do I have to expect that my kids will? It doesn’t mean I don’t try to teach them moderation or teach them to think carefully about their options before just blindly choosing to eat a sugary treat that’s offered (and certainly, with P.’s food dye allergy, we have to do more education on this topic than I even would have on my own). It just means that I don’t expect them to live in a sugar-free bubble where they really believe that strawberries are just as much a treat as cookies. Are strawberries as GOOD as cookies, or even sometimes better? Yes! Are they a special and wonderful sugary treat? No! They’re green-light food. I’m not going to pretend anything else, and I know my boys are smart enough to have picked up on this fact, even if I do spend lots of time and energy trying to make kale seem as desirable as a cupcake. I can’t possibly control every exposure they have to junk food outside our home — that’s out of my hands, ultimately. But what I can control is figuring out how to raise them in that delicate balance of wanting, enjoying, and appreciating healthy food, while not feeling deprived, longing for what their friends have (at least, not too much or too strongly), or wanting to rebel against eating the healthy stuff because they feel stifled. To that end, I’ve had to start rethinking the lunchbox treat. Oh, I used to scorn the lunchbox treat. I did. I thought that if I was packing lunches for toddlers and preschoolers, then every bite should be as nutritious as possible — I was cramming vitamins and minerals and my own overachieving ways into every bit of food in their lunches. I don’t think I was wrong (although perhaps I put a little too much pressure on myself to get it “just right”); but now that the boys are getting older, and L.’s in a bona fide elementary school setting with a real cafeteria and real opportunities to compare his lunches to those around him, I think I have to tweak things a bit. See, even a really, really good kid like L., who tells me constantly that “You make really great lunches, Mommy” and loves to eat healthy food, will sometimes look to his left and see the cookies and fruit punch; look to his right and see the chips and fruit snacks; and look down in front of him at the carrot sticks and unsweetened applesauce and lose some of his enthusiasm for that food, no matter how much he likes it. Even a great eater, when confronted with the shocking reality that he is in the probable minority of children at his school, will feel some peer pressure about eating kale and unsweetened yogurt when everybody else (at least in his estimation) is eating pizza Lunchables and Cheetos. And — I think, at least — if we don’t throw these great eaters the occasional bone to keep them happy with the lunchbox experience, we run the risk of watching their interest steadily dwindle as their resentment about being the “different” kid, the kid with the “weird” food, grows. That doesn’t mean that I advocate packing those Lunchables and Cheetos, by any means (although I did reach a compromise with L. recently about organic bunny-shaped macaroni and cheese for school, a formerly no-go food in our house). What I do think is worth considering, though, is finding opportunities to put in what I might call “damage control” treats a couple of times a week, so your kid isn’t the only one who NEVER gets dessert or NEVER feels like lunch is a little extra-cool. Damage-control treats are, ideally, things you feel are a reasonable compromise (like that bunny macaroni); that still don’t totally blow your family’s food values; and that your kid will view as special, or as a way of helping them fit in. Small pieces of high-quality chocolate? Win. Organic fruit snacks without artificial dyes, in a tiny single-serve package? Win. Single-ingredient fruit leathers? Win. Small portions of homemade baked goods, like mini-muffins or an oatmeal cookie? Win. As long as you don’t send this stuff every single day — thereby diminishing the “specialness” of the treat, as well as possibly ruining the whole concept of treat-frequency in your house — a couple of these randomly placed in the lunchbox throughout the week will keep that old spark between you, your kid, and their lunchbox alive. It’s like couples therapy for lunches. Need damage-control treat inspiration? 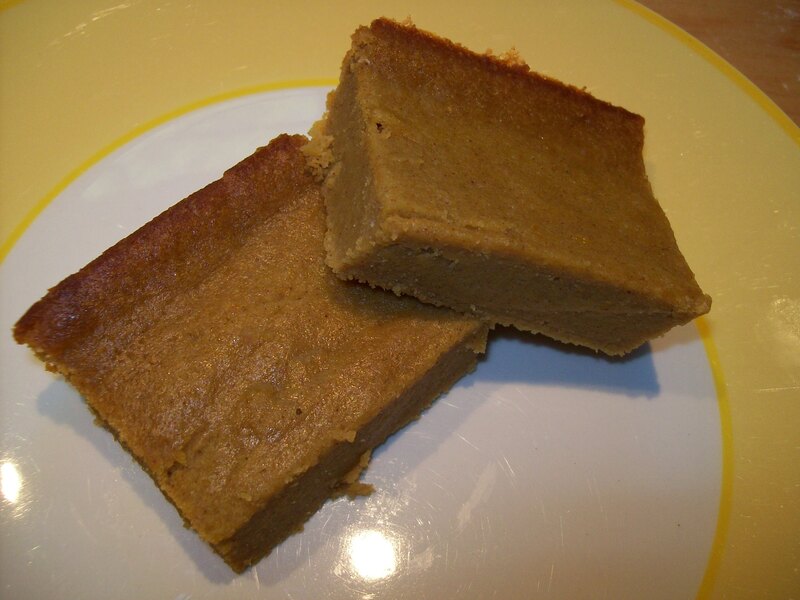 These pumpkin custard blondies are so easy to make, an eight-year-old could probably do the bulk of the work without any help. Moist, lightly sweet, and gently tasting of fall, they’re just the right answer at this time of year. This entry was posted in Accountability, Feeding kids, Food culture, Lunchbox, Parenting and tagged back to school, baking, cooking, family, feeding kids, food, halloween, kids' health, lunchbox recipes, lunchboxes, meal planning, milestones, parenting, pumpkin, recipes, school lunch, what to pack for lunch. Bookmark the permalink. I sent my chitlin a couple of quarters of waffle–no syrup!–and some frozen (defrosted by lunchtime) and a small container of yogurt for lunch one day. The waffles had a little added protein powder and were otherwise not terribly different than bread, but he felt it was a very special treat. =) He reported that his friends expressed envy! Lol! Sometimes special presentation is all it takes to make them excited about it. That is certainly true as well — even something as small as just putting some toothpicks with pirate flags in the tops of my kids’ sandwiches can sometimes make or break their lunch!